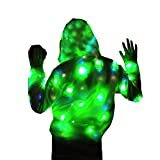 Light up hoodies have EL wire running around the front seam and the hood, which glows in a choice of colors and in slow and fast blinking modes. EL is short for Electro Luminescent, and is a wire that lights up when powered by electricity from a battery. Most light up hoodies are charged by 2 AA batteries inside a battery pack unit which is hidden away in the seam of the hoodie’s pocket. Light up hoodies are getting more and more popular with every passing day. They have been around for some time now, and if we talk about light up clothes, they’ve been around for decades, worn by celebrities and glam rock stars of yesteryears. 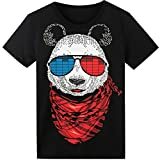 The biggest difference between light up clothes of that time and today is that now, they have become very affordable and easily available to anyone. A decent light up hoodie costs anywhere between $50 and $70, and you can buy them from a wide choice of online stores. You will find them on Amazon, and most other ecommerce websites. With Amazon’s air-tight return and refund policies, it makes more sense to buy from there. A problem with the light up hoodies which makes it more important to have a return policy in place, is that their size runs slightly tight and on the smaller side, so many times they don’t fit well, and the hoodie has to be exchanged with the next higher size. Amazon does that without any questions asked, and immediately. 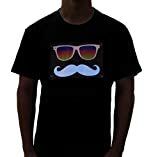 Along with light up hoodies you can also go in for light up T-shirts, halter tops, ties, sunglasses and a lot of other clothing accessories available to buy from online stores. Light up hoodies are extremely popular with young and old, and is becoming the hoodie of choice for festivals, music concerts, parties, jogging at night, discotheques and funky celebrations and night-outs. Though a lot of youngsters wear light up hoodies, the older audience is also wearing them. Many people who jog or cycle at night prefer to wear light up hoodies as it makes them visible in the dark. Most light up hoodies also come with a sound activated battery pack option, which makes the EL wires light up to the sound of music. This costs an additional $8-10. 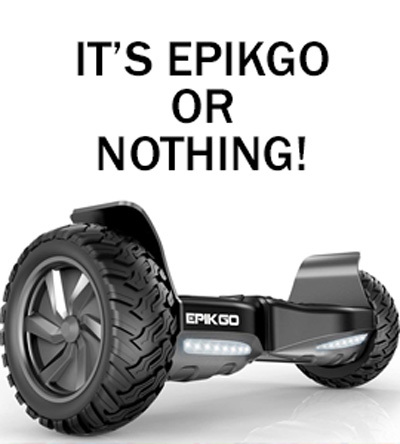 Lots of skateboarders also like to wear light up hoodies, and another great combination would be wearing light up hoodies while riding your hoverboard, also known as the mini segway. Though light up hoodies are durable, of a good material and well made, care has to be taken when washing them. The instructions with the EL hoodies say that they are machine washable but should be washed in cold and delicate mode and should NOT be put in a dryer as it will spoil the hoodie. IMPORTANT NOTE: Unplug the battery plug and remove it from the hoodie before washing. If it gets into water, the battery pack will stop working. TIP: If you put in rechargeable batteries, you will not need to buy new batteries every time you go out in your light up hoodie. A fresh pair of batteries on the average lasts for about 8-10 hours. A good piece of advice from someone who regularly wears light up hoodies, is that if you plan to wear the light up hoodie for a long duration, then you should carry along an extra pair of AA batteries. For most light up hoodies, the options for the colors in which the EL wire glows are Blue, Green, Pink, Red and White. The lights are controlled by a single switch on the battery pack. Just by pressing it you can switch from off to on, to slow blinking to fast blinking. The blue color glows the brightest amongst all of the colors of the EL wires, and is more popular than the others. The optional sound activated battery charger pack which will make the light glow according to the beats of the music, is especially awesome in music festivals and parties. The material of the hoodie is very good, and feels thick and soft. It is made from the regular track suit material and is of a good quality. The hoodie is quite warm and will keep you warm and cosy in spring or fall, but it is not enough for the real winter cold. The EL or the electro luminescent wire is stitched on very neatly, and even when the wire is not glowing, say in the day time, it looks good. As for the size of the light up hoodies, most people need to order one size up. The hoodies are fitted (slim cut), and may feel small if you order it in your regular size. We suggest that you order one size up. Some people who have ordered the light up hoodies have noticed a faint buzzing sound when the EL wire is lit. It is more audible when you wear the hood and the EL wire is close to your ears. 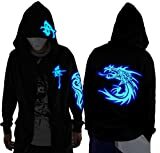 Overall the light up hoodie is a terrific piece of glowing apparel, a head turner, good quality, the EL wire lasts for about 3 years, they work well and you should go get one for yourself now. Light Controller comes with 3 Modes - On/Off, Fast Blinking, and Slow Blinking. Lasts over 24 hours on a new set of batteries. Light controller takes 2 AA batteries and has 4 settings: Full On, Fast Blink, Slow Blink, Off. Hoodie features an inner battery pack pocket to conceal while wearing. We offer a 90 day warranty on the product. If for any reason the hoodie breaks under normal usage, we will replace it within 90 days. 3) You can use for a long time.it's waterproof,can wash it normal,hand washing. 4) this is our new high quality LED Coat for Club,Christmas Party,Carnival,Casual Wear,Festivals Stage Dance Performance! 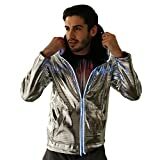 5) Put on this beautiful Led Jacket ,your will be the most shining in the audience. You will gain a ton of praise. Out of this world Astrohoodie! 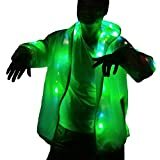 Rave Green Color Light Up Unisex Casual Jacket with colorful LED light. US Size: M/L, XL/2XL. please check the detail measurement carefully in the description. Light Up LED - Built-in nice and twinkling sparkling Green LEDs, being the Focus of people's attention in the night. 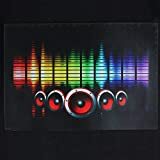 Great For Hip-hop,Club,Christmas Party,Carnival,Festivals Stage Performance! also can wear in daily life or wedding when no lighting. COOL HOODIES FOR BOYS: Give a gift that will truly light up a boy's christmas or holiday spirits or a kid's birthday! 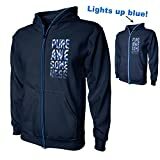 This awesome hoodie lights ups in three light settings which can be easily controlled with a hidden remote control. A truly unique and one of a kind gift! Remote uses 2 AA batteries (not included). LITTLE BOY'S AND BIG BIG BOY'S SIZING: Each design is available in both little kid's and youth sizing. This hoodie is for Navy color with Pure Awesomeness design. LIGHTWEIGHT KID'S JACKET: Made of 100% Polyester with fleece lining and kangaroo pockets to keep your kids warm while he's looking cool with a hooded jacket that lights up anytime. EASY TO WASH AND CARE FOR: The remote control is detachable so you can easily and safely wash the hoodies in the washer. FIND MORE AWESOME T-SHIRT & GREAT DEALS AT OUR FSD STORE: This original FSD Tshirt design is also available in Men's T-shirts. FSD is your T-shirt and Apparel source - our original designs and quality products with affordable price will surely make you a loyal FSD fan! Check out our other t-shirt designs for Men, Women and Kids. 1) size S-M-L, this Fur vest is the US Standard Size .Color:white,Long fur coat: 3 x AA battery the coat will shiny 7 color multicolor. 2) This Item not including the battery .Fit women / girls wear it.Not Disposable products, you can use for a long time. 3) this is our new high quality LED Coat for Club,Christmas Party,Carnival,Casual Wear,Festivals Stage Performance! 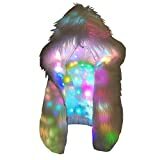 4) Put on this beautiful Led Fur Coat,your will be the most shining in the audience. You will gain a ton of praise. 5) We are a leading manufacturer of special costumes and this is our new high quality LED Fur Coat for Club,Christmas Party,Carnival,Festivals Stage Performance! Zipper Closure, From May to September, the hoodie is thin because of the hot weather.From September to May of next year,the hoodie is thick with fleece innner! Machine or hand washable, From May to September, the hoodie is thin because of the hot weather.From September to May of next year,the hoodie is thick with fleece innner! Aisan size,runs smaller than US size,please check your body size and refer to our size details on description area before purchase!Thanks! From May to September, the hoodie is thin because of the hot weather.From September to May of next year,the hoodie is thick! Extra soft with an even glow top to bottom. You have to see it to believe it! Our ultra plush 100% faux fur is hand picked in LA. You going to love the feel. The new color changing hood has 20 different colors to choose from and 16 dynamic color changing modes! 1. They are fitted and a slim cut so you may want to order one size up. 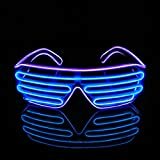 You may also like these cool light up EL wire sunglasses. Please recognize Aquat-LED the authorized legal representative of Pinfox products. 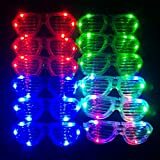 The rave glasses is pretty cool and attractive and make you the star of parties. Fun for parties, shows, rave concerts and festivals. Easy to use. Single-button design. Press the button on the battery pack to change the EL glasses to light in any one of four modes: steady glow / blinking / FLASHING / off. Glasses work with a battery pack attached by wire ( NOT CORDLESS ). Independent battery pack with two 1.5V AA dry batteries can provide the adequate power to ensure a longer continuous light up time (two hours at least depending on your battery capacity used). The pack and glasses are connected by a 35" wire. You can easily hide the pack in your pocket, clothing or chip in belt by the clip of the pack. 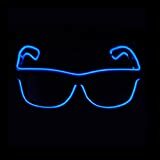 High quality LEDs that illuminate the light bars.These eye glasses feature 6 bright LEDs per color. Glasses Color: Blue, Green, Red,White. An assortment of 12 shades are included in each box. Suitable for Wearing them in the night club ,festivel ,party, any occasion and also can as gifts for friends . High-quality EL wire brings excellent visual effect and longer continuous glow time at night. Stylish sunglasses frames WITH CLEAR LENSES provide you with a sense of style. Glasses work with a battery pack attached by wire ( NOT CORDLESS ). Independent battery pack with two 1.5V AA dry batteries can provide the adequate power to ensure a longer continuous light up time (two hours at least depending on your battary capacity used). The pack and glasses are connected by a 35" wire. You can easily hide the pack in your pocket, clothing or chip in belt by the clip of the pack. Also check out these made for concerts light up T-shirts. Powered by a battery pack cleverly hidden within an inside shirt pocket.Requires 4 AAA batteries (not included).With fresh batteries in the battery box, Arc Reactor will glow when switched on. Hikari Company offers an exclusive manufacture warranty of 3 months. This warranty is exclusive to sales through Hikari Company and only our authorized re-sellers. Purchases made through unauthorized re-sellers would not fall under the manufacturer's warranty. Please do not purchase from various third party seller as it will NOT be included in our manufacturer's warranty, and may be a knock off and therefore be unsatisfactory quality. Without a pair of good LED Light Up shoes you cannot complete the look. Today LED Shoes are available at a very affordable price. We have also put together a list of the Top 10 LED shoes as well as a comprehensive buying guide on LED shoes, which you should take a look at right now!